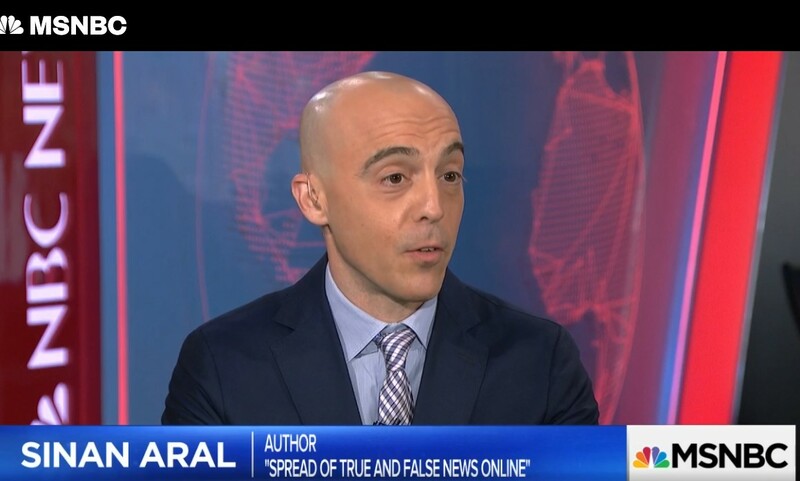 In a recent interview, MIT professor and IDE co-lead, Sinan Aral, talks to MSNBC about how and why fake news stories are shared--by humans-- at such a high frequency, and what can be done to stop it. Aral, a co-author of the study, described how platforms such as Facebook and Twitter can be manipulated and used to spread false news. The recent, in-depth study, The Truth About False Online News, was published in Science on Mar. 8. The researchers found that false news travels farther, faster, deeper and more broadly than the truth online in all categories. The effects were more pronounced for false political news than for false news about terrorism, natural disasters, science, urban legends or financial information. Also, contrary to conventional wisdom, the study found that false news spreads more quickly than the truth because humans, not robots, are more likely to spread it. Watch the full March 20 news segment here.